Woohoo!! Dow 20,000!! Do I hear 30,000? 40,000? C) Most of the Dow gain has come from the rocket-like performance of Goldman Sachs since the election. Wait, that seems weird - didn't President Trump say "Goldman has TOTAL control of Hillary" 3 weeks before the election? Why would Goldman be soaring after President Trump's victory? Oh, that's right, he's stacked his cabinet with more Goldman insiders than Sec. Clinton could have ever imagined nominating. Right or wrong, the belief is that what's good for Goldman will become gospel in DC over the next few years (well, even more so than it already is) and the belief is that will propel their earnings higher. I struggle with all of the assumptions being made on Wall Street today. It's no longer important that a company actually, you know, make money. However, if they can allude to the fact that in 2054 they might have a product that could sell 100,000,000 units at $10/unit the stock will soar $50 in 0.004 microseconds. Obviously, that's an exaggeration but take the latest jump in stocks over the past two days. It's been driven by the hope that maybe Congress in its eternal wisdom can identify the best way to spend $1 Trillion of your tax receipts (remember budget deficits which dominated the conversation 3 months ago?? Yeah, Congress seems to have forgotten as well). Again, with no clear understanding of who, what, where or when any of these projects would take hold, the stock market bid up every company even remotely associated with domestic construction. 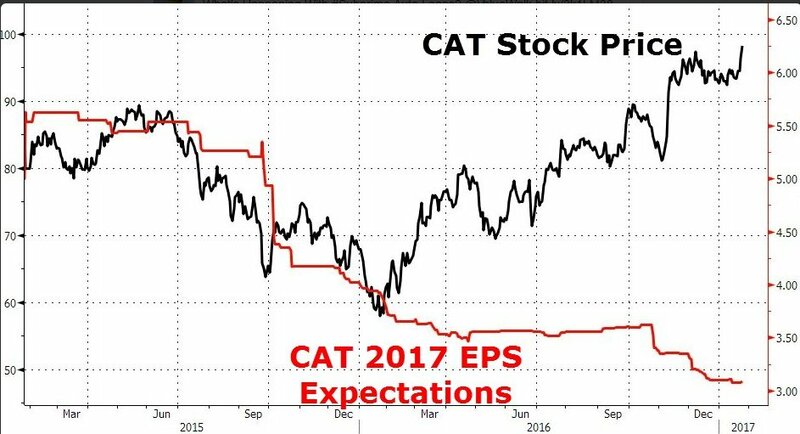 Caterpillar is a perfect example of this new paradigm. Their earning expectations have fallen for 24 straight months. Year over year sales have fallen for 49 straight months and yet.....their stock is basically at 6 year highs. Why? Hope that maybe, just maybe, they'll get some of that sweet government cheese disguised as "infrastructure spending". So, here we sit - the Dow, S&P and NASDAQ all at record levels, while earnings flat-line. This is the great untold story of the past 3 years. Since 2014 earnings have effectively gone nowhere (companies have used a combination of aggressive tax strategies and debt to buyback shares to boost reported earnings, but income has fallen flat) but people are paying more for the pleasure of investing in stocks. At times like this, driven by what's called "multiple expansion" you have to be very careful because if the trend reverses (and it always does) you'll get multiple contraction and earnings declines. However, why be a Donnie Downer, tonight it's all about the party and our stock market is driven by Alternative Facts. So pop some Dom, light a cigar and party like it's March 10, 2000 because that's what it feels like to me. Thanks for sharing this best stuff with us! Keep sharing! I am new in the blog writing.All types blogs and posts are not helpful for the readers.Here the author is giving good thoughts and suggestions to each and every readers through this article.Quality of the content is the main element of the blog and this is the way of writing and presenting.Waiting for again wonderful blogs or posts. You can free to browse custom essay writing service for different essay writing ideas.